Fletcher Cove Beach will see 42 Olympic-sized swimming pools of new sand within the month as part of the $102 million San Elijo Lagoon Conservancy restoration project. 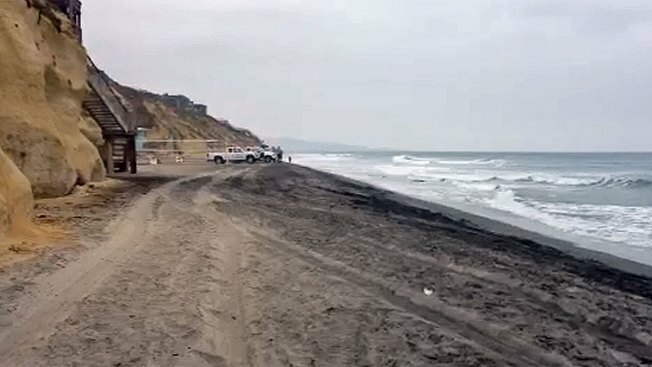 A pipeline was installed last week to Fletcher Cove Beach to receive San Elijo Lagoon’s sand, according to the San Elijo Lagoon Conservancy (SELC). Crews have begun dredging at San Elijo Lagoon, which is the removal of materials from the bottom of the lagoon that have gathered up over time. This may increase the health of San Elijo Lagoon and replenish Fletcher Cove Beach’s sand. SELC warned that beachgoers may smell a wetland odor from the newly placed sand, but reassured that it will be temporary and safe. It was previously reported that sand would be placed off-shore during this replenishment, but SELC has now said that won’t be necessary due to project enhancements. The sand redistribution is expected to finish within four weeks, according to SELC. Work on the site will be 24 hours a day, seven days a week, so nearby residents may hear noises during this time, SELC said. The North County shoreline has seen other replenishing projects over the past two months, with Cardiff Beach also receiving new sand, according to SELC. Some people say the smell can be almost unbearable at times. NBC 7's Steven Luke talks to residents about their health concerns. The lagoon operations are a part of the North Coast Corridor Program (NCC), which is overseen by Caltrans, the San Diego Association of Governments, and the U.S. Department of Transportation. The first phase of the NCC should be completed in 2021.